Yannick Benjamin is a powerhouse in every sense of the word. 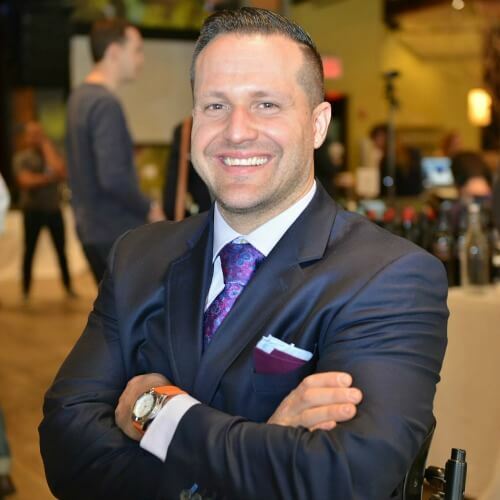 He is a world class sommelier based in New York City. When he’s not sharing his wine expertise, he’s busy being an accomplished para-athlete. In fact, while listening to his incredible insights, he was getting in his daily exercise by handcycling. In addition to his career and his athletic success, Yannick is the co-founder of Wheeling Forward, a non-profit organization dedicated to giving back to the disability community. Push Living is truly honored to be able to share Yannick’s dynamic life story through this interview. You co-founded an organization called Wheeling Forward after you became injured. Would you share with us how and when you became injured, and how it drove you to become involved with Wheeling Forward? I was in a car accident in 2003 on the West Side Highway that left me permanently paralyzed from waist down. I was in the hospital for four months. I had physical therapy, occupational therapy, and was trying to learn new things during my rehabilitation. My roommate while I was recovering at Mount Sinai hospital was Alex Elegudin, who eventually became the co-founder of Wheeling Forward. He was also in a car accident on his way back to school at Carnegie Mellon University in Pennsylvania. You learn a lot about people in the hospital. I had bad days, he had bad days, and we both tried to push each other. We had so many visitors, friends, family members, and supporters who were there for us. I realized that other newly injured people on our floor had nobody coming to see them. We were in a tragic situation but we were so lucky to have support. You know, the grass is always greener. Alex and I decided that once we reached some of our personal goals and started feeling more comfortable in our own situtation, we wanted to help other people. We both went back to school and got our degrees. Alex also started doing mentorship for newly injured people. He started having his own ideas on what he wanted to do and he had a wonderful vision, but when he tried to share it with the groups he worked with, they weren’t going for it. I suggested to Alex to register his own 501(c)(3) and I would be Director of Development. In December 2011, Wheeling Forward became a fully certified 501(c)(3) and in February 2012, we had our first Wine on Wheels tasting. You have quite the interesting career as a sommelier. How did you choose this career path? My background is French. Both of my parents are from France. Much of my family works in the restaurant business. As a kid, I had my destiny set up for me to be in the restaurant business. I love what wine represents. Wine is a representation of the geography and culture of the people involved in making it. I also love the nostalgia and the way wine reminds you of things. It brings pleasure and joy to people. My career started at age 19. I worked at a restaurant called Le Cirque in New York City and a colleague of mine suggested I should take wine classes. Once I started the classes, I knew that I wanted to be a sommelier. My goal was to compete in the World’s Best Sommelier Competition by the age of 26 or 27, but this didn’t happen because I had my car accident at age 25. What are your top recommendations for someone who is new to the world of wine? One of the most exciting regions in terms of quality and price are red wines from Sicily. You can also get good value and complexity in German Riesling. If you had to recommend a wine selection, but could only choose one, what would it be? My favorite wine producer is Joseph Roty. He makes absolutely delicious Pinot Noir from Burgundy in France. It is so elegant, refined, and structured. I find it very cerebral, you know, it stimulates me mentally. It is really pure and delicious. 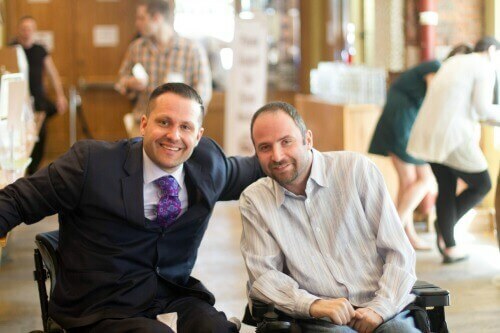 How do you bring together your love of wine with your passion for serving the disability community? Even though most of view wine as being a pretentious subject, or something that only people with a lot of money drink, wine is meant to be a communal thing that brings people together. It’s something you have at the dinner table while you discuss what’s going on in the world. So, Wine on Wheels tastings bring able-bodied and non-disabled people together and I think that’s a beautiful thing. There’s no judgment. Everybody is there for the same reason, to enjoy wine and to improve the lives of disabled people. It will also benefit people who are able-bodied in the future because anyone can become disabled. You’re investing in your future. Does your job involve any travel, and if so, do you have a favorite accessible destination? The most accessible wineries are in California, Napa Valley and Sonoma Valley. All the wineries there are ADA compliant and easy to navigate. I also enjoyed visiting accessible wineries in Australia when I was there four years ago. And I was surprised when I visited an accessible winery in South Africa. What advice would you give someone with a disability who is pursuing a unique career? In my case, it was a challenge. When you are a sommelier you have to work the restaurant floor. You have to go to each table, introduce yourself, and help people choose wine based on their personalities, tastes, and food pairings. I’m a paraplegic and finding a restaurant where I can wheel around is challenging, but deep down inside I always felt it was a realistic goal. I worked so hard. I went to over 100 interviews. Some wanted to hire me but couldn’t, some laughed in my face. But I learned from failure and rejection. I took those as positive lessons. I also found it difficult to carry wine bottles and wine glasses without tipping them. Jean Paul Viollet and I worked on a tray for several months and created one that I can use to carry things around. Three years ago, I was about ready to give up, but I never quit. I continued and never gave up. Finally I did an interview and the man interviewing me said, “Do you remember me? I was a judge at the sommelier contest where you competed.” He remembered me and wanted to hire me. To him, it was never about disability; it was about making customers happy. I learned that we have to have realistic goals and be honest with ourselves. We have to ask ourselves if our goals are attainable. Rejection is part of life. Even able-bodied people get denied. You have to always think about what can you do to raise your profile and improve yourself. Recently, an article referred to you as “wheelchair bound.” How do you actually describe yourself? On the one hand, I am technically “bound” to my wheelchair because I need it to get around. But some people just don’t know the accepted terms. We have to be understanding and remember that able-bodied people don’t know everything about the disability community. Instead of being angry about certain comments, embrace it, ask how you can improve it, and move on. We need to keep wheeling forward instead of wheeling backward. Everyone loves a good love story and we hear you’re engaged! Will you tell us about that and how it happened? I met my fiancée at a wine tasting because she works in the wine industry as well. I was so taken by her energy and her aura. I don’t want to sound corny, but I knew she was the girl. For five months after the event where we met, I didn’t see her, but I couldn’t stop thinking about her. I kept thinking “what if?” and didn’t want to live in regret. Then, I ran into her at a party and we reconnected. We decided to begin dating. Every day it feels just like the first time I met her. She’s my best friend. 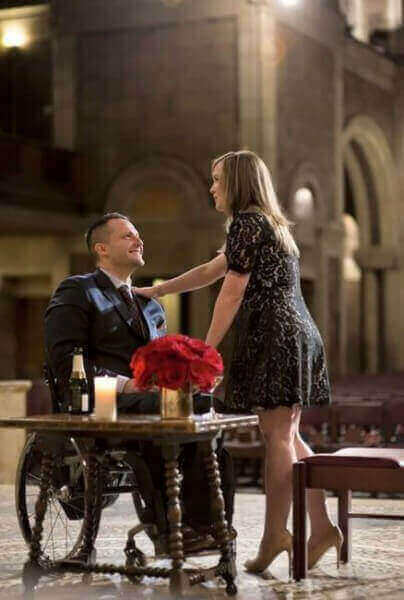 I knew that I wanted to propose at St. Bart’s Church in Midtown Manhattan where we first met. I wanted to surprise her. I called her father and I asked for her hand. He was very supportive, and said “you’re a good guy and you make her happy.” Next, I talked to her siblings and invited them all to a post-engagement dinner I had planned. It was a big risk. What if she said no and I had all these people waiting at the restaurant? I told my now-fiancée a story that Alex, the co-founder of Wheeling Forward, left very important papers in the church and we needed to go there to look for them. I also had her get dressed up and said it was for an important meeting with donors. At the church, on top of the altar, I had a table with a bottle of champagne and roses. There was also a cellist. She said yes before I took out the ring! And then her family and my family surprised her at the restaurant to celebrate. It was a beautiful moment. Word on the street is you’ll be appearing on television soon. How did that come to be? Let’s be honest, I’m in a unique situation. There’s a story to be told that can make a difference in our community. People with disabilities don’t need to be hidden away. We want to be in the forefront, we want to be seen, and we want to be heard. The show is a spin-off of movie called Somm. It will be on the Esquire channel. 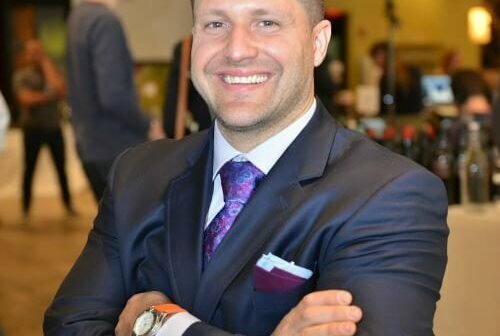 The show will follow six New York City-based sommeliers, focusing on their lifestyles and preparing for the big master sommelier examination, which is the highest level you can achieve. When you’re not busy sharing your wine expertise or advocating for the disability community, what other activities do you like to do? I’m going to start training for the New York City marathon in November. I also love to travel with my fiancée and we’re going to go to Aspen, Colorado soon. In the fall, we’re going to go to France. I love to spend time with my family and I love to spend quality time with my fiancée. Oh, and I also love to play practical jokes on Alex. What words of wisdom would you like to leave with our readers? I think the most important thing is to not fear rejection. Embrace failure or rejection, learn from it, and move on. Realize sometimes rejection isn’t just about your disability and find ways to keep improving every day. How can we keep up with you and Wheeling Forward? Hey Buddy!, I found this information for you: "Interview with Yannick Benjamin of Wheeling Forward". Here is the website link: https://pushliving.com/interview-with-yannick-benjamin-of-wheeling-forward/. Thank you.